71 percent of the Earth's surface is ocean. From the Gulf of Mexico to the Strait of Hormuz and in between, there is only one premiere military force of the world's waters. 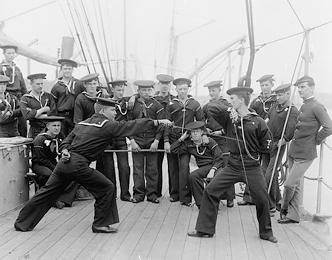 Established in 1775, the Navy is older than America itself, predating the Revolutionary War. Famous for being an integral part of our agile military and having a major role in both war and peacetime, the Navy has undoubted influence on international stability. The Navy Memorial is a grand public plaza at 701 Pennsylvania Avenue NW . This military memorial has a granite amphitheater that includes a 100-ft diameter world map, and is surrounded by statues, fountains, and flanked by life-size battleship masts. Oft overlooked, but definitely a Washington DC Must See.